a tiny bit of what I read: The man who had one talent in the parable was nearer perfection than the man who had five because his talent was growing through interest. Perfectionism means simply living up to the measure of light that is given, (our one talent), and if we are faithful to that, we shall be given more…The divine Light is a principle of growth. and also: For the quietest, worship requires a passive as well as an active phase, a negative as well as a positive way…..The Quaker quietists were far from quiet once they were assured of the right word or deed. Their period of withdrawal was followed by a return to activity with an increase of insight and power….This flowering (around the year 1740) was not characterized by any outburst of literary or artistic production. 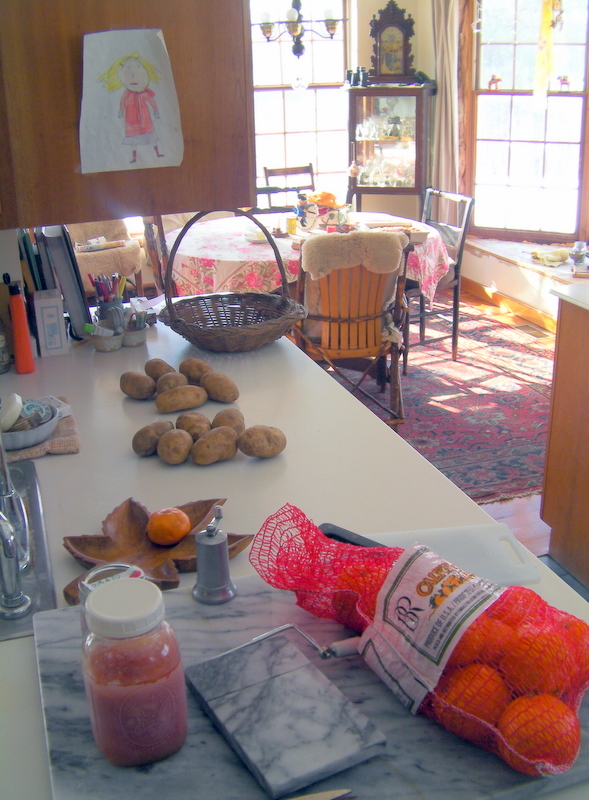 Its whole emphasis was on life itself in home, meeting, and community. This life was an artistic creation [that was] as beautiful [as art]. Preheat oven to 350 degrees. Pour melted butter into a 2-quart shallow casserole and coat bottom. In a mixing bowl, combine milk, 1 cup of sugar, flour, and baking powder. Stir until blended (batter will be lumpy). Pour over melted butter. Do not stir. Arrange fruit over top. Sprinkle with 1/2 cup of sugar. Do not stir. Bake 30 to 35 minutes or until top is golden. Serve hot, room temperature, or cold, with vanilla ice cream. To be honest, as nice as the morning was, in the afternoon I worried instead about all I still had to do and all I hadn’t done. Then the girls came home and I was too busy to worry. Harriet came in and announced her day was awful- she had taken state tests all day. Because of the testing there was no homework; she got to go to the barn with Billy instead and fix a door. So things are getting done. Yes. Your morning was heaven on earth. 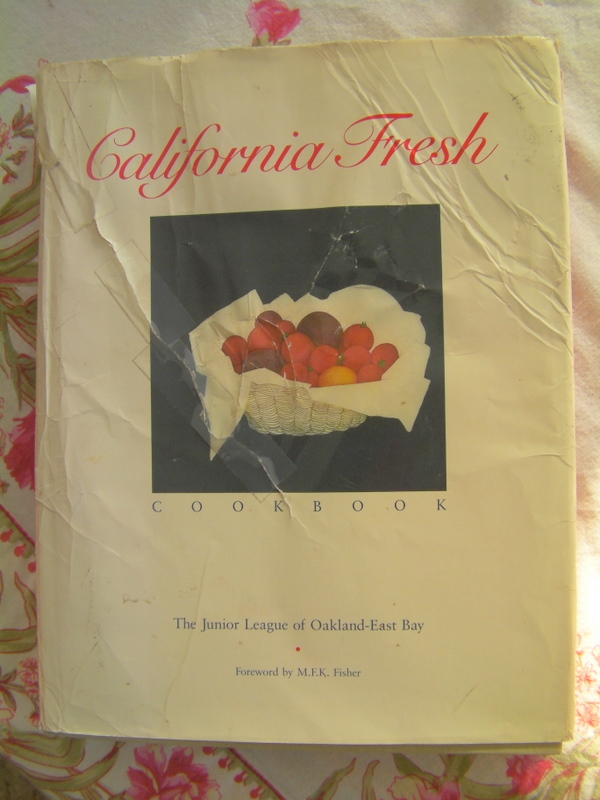 Mary Ann, this cookbook has a short but funny (and well written) foreword. It is 100 times more interesting than the history of Quakerism that I tried to work through yesterday. I know you are not the biggest fan of cooking in the world but the book is worth it for the foreword and the illustrations. And the recipes are not pretentious. This is a rare combination. Thanks for the wisdom of quietism. I hadn’t been aware of the word. Your morning sounds like heaven to me. Someone said that happiness is a full day of a routine that works. All we can do is cultivate our little patch of earth, somedays. And since I live in a high-rise apartment building, I can’t even do that, but I live vicariously through your site! Thanks for those links! 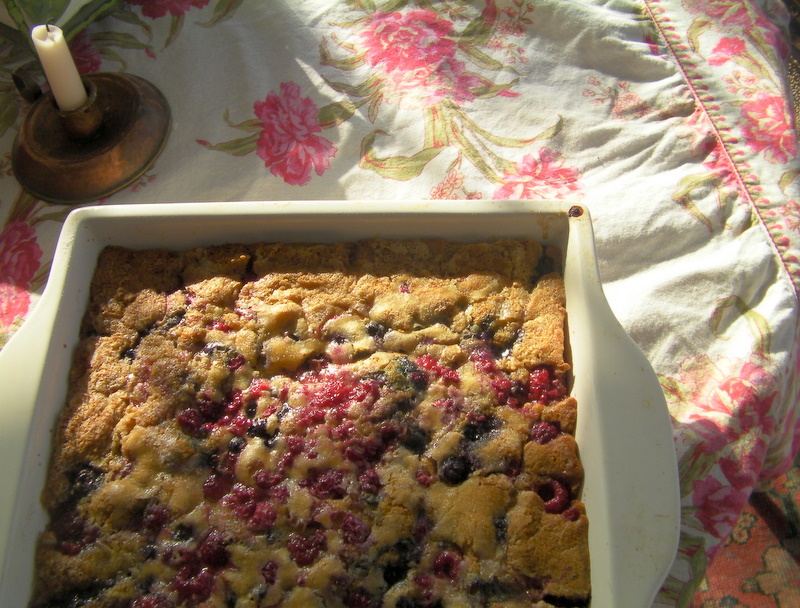 And if you find time for the cobbler let me know how it turns out. Sending love to you and N too! What a wonderful morning. Mine was spent at Jury Duty. Were you selected? And wouldn’t it be fun to have Beth be the judge? She actually came out and announced we could all go home after 3hours.